Dad grew up in Star Valley, Salt Lake City, and Ogden, and served a mission in Tahiti from May 1938 to August 1940. He married Mom in the St George temple in 1941. Together they raised three kids and in 1987 completed another mission in Hawaii, where they worked mostly at the Polynesian Cultural Center. Favorite missionary picture pose, 1987. 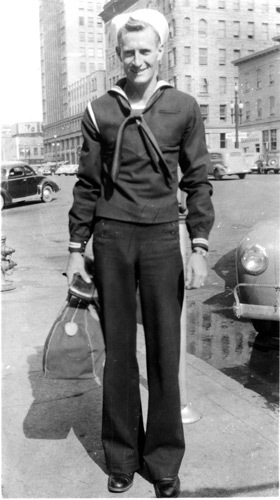 Not long after his first mission and his marriage, Dad served in the Navy in San Diego during WW II. He was a member of the Seaman Guard. He loved to hunt and fish in Wyoming and Montana, and to play golf. He always found more golf balls than he lost, and he liked to give them away. His last Stake President said, "Your dad was a great man--he always gave me golf balls." Dad served in the Church all his life and always encouraged his family to be faithful to it. I was born in Afton, Wyoming on November 10, 1917, son of Seymour Bert and Ellen Child Allred, in the home of my mother's parents, Orville and Eunice Child, a home I have seen only a few times since and have no recollection of it other than its two-story frame construction. At the age of two I was taken by my parents, along with my five sisters and two brothers, to live on a dry farm out of American Falls, Idaho. This was a near disaster as far as a livelihood went. We later moved to Logan, Utah where we resided for an additional two years. My earliest recollection of childhood dealt with our home in Logan, the pasture where we kept a cow, the raspberry bushes, the canal and surrounding hills, trading eggs at the store for a few pennies to buy a piece of candy, Saturday shopping for groceries, and my first ride on an electric train to Hyrum, Utah for a visit with relatives. I was three and four years of age while living in Logan. From Logan we moved to Ogden, Utah to live once again in Grandmother Child's home, at 613 28th Street. A few of my early memories are: the marriage of my oldest sister, Edith, Christmas time with real candles on the tree for lights, my first ride in a Maxwell car with a rumble seat, the spending of an occasional penny or nickel at Carr's grocery store, my first day at Madison school, and later having to drop out of school for a year because of an appendicitis operation. My Dad, being a school teacher, often brought books home for me to read. I always looked forward to his coming home each evening. At age seven I went back to school and was a good reader by then. From this home we moved to 828 28th Street, a real home of our own instead of Grandmother's apartment. The few years we lived here were filled with happy memories. I attended the Quincy School for first, second and third grades, and then transferred to Lewis for the fourth grade. Days of play and not too much responsibility were mine to enjoy both winter and summer. My first grade teacher was Mrs. Blucher. A Sunday-only Salt Lake Tribune route paid me 15 cents a day as helper to my brother, Owen. We walked from the Bamburger Railroad Station to the East Bench. Also, I remember baseball at Monroe Park where I sold water to players for five cents a glass. An Accident during the winter of 1924 left a scar on my face which was to carry for life. I was sleigh-riding down 28th Street and ran into the rear end of a car. While in the fourth grade of school, I won a penmanship award which took many hours of work to complete. My teacher was Miss Pickett of Lewis Grade School. From our home on 28th Street we moved to Salt Lake City. I really felt bad about moving, but being eleven years of age, I soon adjusted to our new home. Dad used me a lot in construction work, as he had given up school teaching for a better paying job. I have always looked back upon the three years of living in Salt Lake as a fond memory. Depression days made it difficult to make a living, but although we didn't have much, each new toy or item of clothing was appreciated even more. A new pair of roller skates, a sheepskin coat, a home-made pair of skis each seemed to bring me great joy. I was in the fifth, sixth and seventh grades of school while living in Salt Lake. The things I remember about school are: the strict discipline--suit pants, only, no levis allowed; always a necktie had to be worn; and the “F” I received in penmanship although I was one of the better writers in the class, which seemed ironical because of my previous award. Due to the depression of 1932, we were forced to move back to Ogden once again because the work possibilities were greater for Dad. We all hated to leave Salt Lake, but we went with Mom and Dad as usual. Back to Ogden, I enrolled at Lewis Junior High for eighth, ninth and tenth grades. This was the fun period of my life, discovering girls, participating in school athletics under Cliff Doxey, playing a lot of M-Men basketball for the 18th Ward, taking part in two school operettas with Edna Hardy as teacher and director. A few of my close friends during these years were Mark Stephens, LeMoyne Petersen, John LindQuist, Joe Stegen, Jud Colyar. And later in athletics: Jack Hazen, Reed Petersen, Emil Henderson, coach, Wally Baddley, coach, and many others such as George Doxey, Gene Hall, and Tracy Hall (of synthetic diamond fame). I will always remember the summer of 1934, when I returned to Afton, Wyoming to spend a couple of months on my uncle's ranch. Here I learned to ride horses, milk cows, date girls, and grow up considerably. It was a tough summer, but it did me good. I went to Ogden High School for two more years of schooling. ROTC was an interesting phase for me. I made Crack Company and performed at the big ROTC Ball at the White City Ballroom on 25th Street. This experience proved beneficial to me when I was inducted into the navy in 1945 and had to draw from previous military training. It made Petty officer in Seaman Guard much easier. In 1936, I graduated from Ogden High School and entered the field of labor. Also, became a member of the Eighteenth Ward Male Chorus, which President David O. McKay was instrumental in organizing. Going down Washington Boulevard one afternoon, driving my Dad's old clunker, I hit the back fender of Ralph Mitchell ' s new DeSoto. No money, no insurance in those days. No excuse. He was considerate enough to want to know how I was going to pay something like $35.00 to repair the damage. I was smart enough to ask him for a job to work it out. My first check was his, but after that I worked nearly a year for him, quitting only because a great mission call had been received. 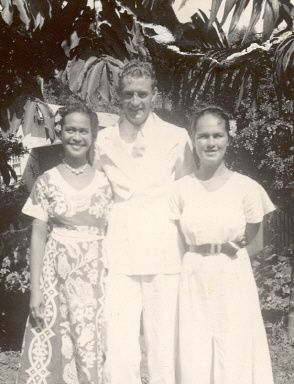 May 15, 1938, saw me leave for the Tahitian Mission--the greatest event of my life. I could spend hours on hours telling experiences both spiritual and physical which happened over the next 27 months. I loved it--not only the work but the people I labored with and the great companions I had. Travelled a lot, spending time on 14 different islands. Three months were spent travelling on small copra boats from island to island. I know what seasickness is. The last assignment I received from President Stevens was to go home and get married. This was uppermost in my mind, but before I could get too serious about my last assignment, I had to get a job, and jobs were not too plentiful. I had a little money saved from my mission, so I enrolled at Weber College for Fall Quarter, signing up for classes which would qualify me as a teacher in the field of education. School didn't last long as I was offered a job by Gene Robinson, manager of Edgehill Dairy, 3901 Tyler Avenue, behind Arnold Ferrin' s home .I was recommended for this job by Carl Lindquist. I was guaranteed $75.00 per month, with a possibility of making $125.00 if I worked hard driving a milk truck and delivering milk to Edgehill customers on the East Bench. A few months later, I met a tall brown-eyed brunette from St George who was to help me finally fill my last mission assignment. 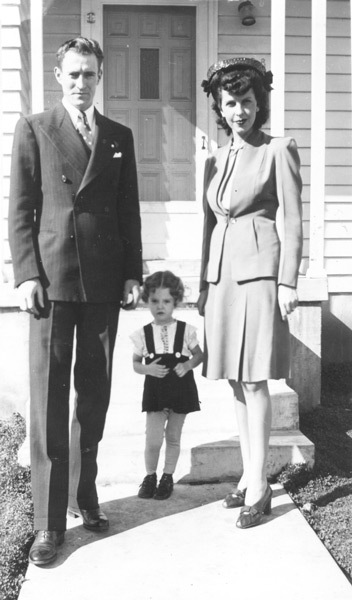 On April 15, 1941, just ten months after I returned home, I met Irene Carter from St. George, Utah. Two months later, after a brief courtship but with a positive knowledge of what I wanted for a wife, we were married in the St George Temple, with President Harold Snow performing the ceremony. I met Irene at an M-Men-Gleaner Girl party in the 17th Ward Recreation Hall. I had just been elected President of the Mount Ogden Stake M-Men, and she was there with Gladys Wight who was President of the Mount Ogden Stake Gleaners. I asked Gladys who the good-looking brunette was, and she said, “She is my adopted daughter,” as Irene was living with the Wights. Would she introduce me? Surely! After dancing with her several times, I asked Irene if I could see her home. She said, "I won't go home with you without you get permission from Gladys." We walked over to Gladys, and Gladys told her she would be safe with me, so she consented. During the next two months, we saw each other nearly every evening, and were married on June 17, 1941. To sum up my years of employment, I worked as a retail driver for three years, at which time Edgehill was taken over by Weber Central Dairy. I worked as retail driver for them for two years and as wholesale driver for two years. Then there was a break for a hitch in the U. S. Navy, having received "Greetings" from Uncle Sam telling me to report on April 6, 1945. One very interesting year was spent in San Diego, California, at the Naval Training Center. I went in as a boot at age of 27. Married with two children and a home at 128 Country Club Drive in South Ogden. While in San Diego I went through Boot Camp as a Seaman, graduated as Seaman 2nd Class, made Seaman 1st Class, and qualified for Petty Officer 3rd Class. Was in process of getting stripes when my honorable discharge came on April 6, 1946. The enjoyment of my service was being a Petty Officer in the Seaman Guard with 15 men under my command. We had guard duty day and night at the banks, the Commodore's "shack," and in charge of raising and lowering the colors morning and evening over the entire Training Center. I was proud of this position--felt really patriotic. Along with the better parts of this duty, I was able to go home each night to be with my family living in Pacific Beach, a small suburb of San Diego close to the ocean. From the service back to Ogden to work, starting again where I left off--delivering milk. This time it lasted only until the spring of 1949, when I was given an office job as wholesale supervisor for two years, and then was asked to fill in as Credit Manager until a full-time employee could be found. This position kept me occupied for three years before I was replaced. Only then because I asked for the job of Purchasing Agent, thinking I would like to spend the company money rather than worry about collecting it. Purchasing kept me busy with a lot of responsibility for the past 28 years until I retired April 1, 1980. I also had acquired the job of Treasurer-Manager of the Cream O' Weber Credit Union, a job which I have held for 10 years and am doing at the present time on a two-days-per-week basis. This is an elective job, so until I can get someone to run for the office, I will have to continue. Thinking back over the years, I really have had an enjoyable life. During forty years in the labor force, I missed no more than three days of work because of sickness, other than four days hospitalization at the time I was diagnosed as a diabetic in 1966. I have enjoyed many days of hunting and fishing with very likeable companions. 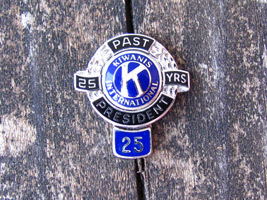 I was an active member of Kiwanis International for 25 years, in the South Ogden club. I held the offices of 2nd vice president, 1st vice president, and president; and also many years on the Board of Directors. Received a 25-year award for perfect attendance. 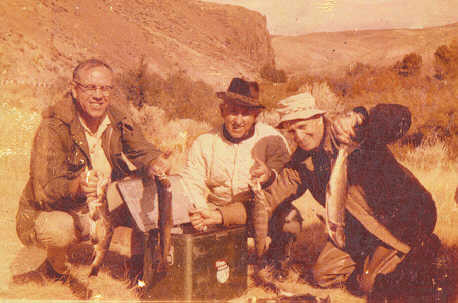 The biggest trout I ever caught was 6½ pounds. I have shot over 30 deer during my hunting days, one elk, one coyote, numerous rabbits and pheasants, a few ducks, quail and partridge, many sage grouse and a few blue grouse. I still like the mountains, lakes and scenic areas. My present outdoor activities are golfing, fishing and yard work. Won third place in the Utah-Idaho District Kiwanis Golf Tournament one year. Have two trophies for horseshoe pitching. My daughter, Carmen, living in Hawaii, is a Registered Medical Technologist, an accomplished pianist, and also teaches piano lessons. 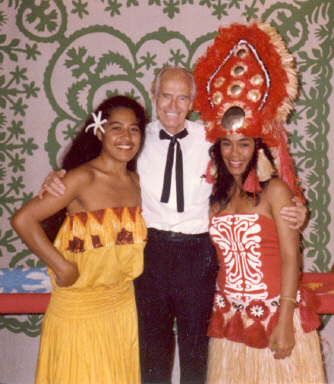 Before she left Ogden in 1977, she had a dancing school where she taught Polynesian dancing. She has displayed oil paintings publicly, does both water and snow skiing, is a licensed scuba diver, and has won awards in high school for sewing. At present her latest hobby is stained glass work, and she just recently completed a beautiful window more than 6 feet high. She has four adorable daughters and a good husband. My eldest son, Forrest, served a mission in Scotland, baptizing many people into the Church. He has a Master's Degree in Mechanical Engineering and worked first at China Lake Naval Weapons Center in California, later transferring to Hill Air Force Base at Ogden. At present he is managing a Top Secret program pertaining to the minuteman missile. He has a lovely wife, eight children, and a small farm in West Weber, where he holds the position of Finance Clerk in his ward. Gregory, our youngest, served a mission to Brazil. 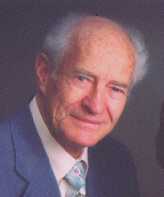 Upon graduation from Weber State College, he received a teaching assistantship to Brigham Young University where he received his PhD in chemistry. He is now at the University of Lethbridge, Canada, doing research in oil sands. He has a lovely wife and two sons. He is the librarian in his ward, and his wife teaches Relief Society. The positions I have held in the Church are: Deacon Quorum President, Teacher Quorum President, Priest Secretary, Elder, Seventy (was one of the Seven Presidents of Seventy Quorum, Riverdale Stake), Sunday School teacher, Priest teacher, President of Sunday School (Mountain Green Ward), High Priest Secretary (Mountain Green Ward), Finance Clerk (33rd Ward). As an M-Man in the 18th Ward, I received a Master M-Man award. As M-Man instructor, I took on the project of getting other young men to strive for this honor. 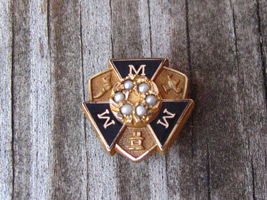 In that year there were approximately 12 young men who obtained their Master M-Man Award. Then, in the 49th Ward, as Priest Instructor, it was my pleasure to see at least 12 out of the 16 priests serve missions. My life has been very Church-oriented. I am thankful for the Gospel and will always have a very strong testimony. This history is written as of August 31, 1980. I hope to add more to this as time goes by.